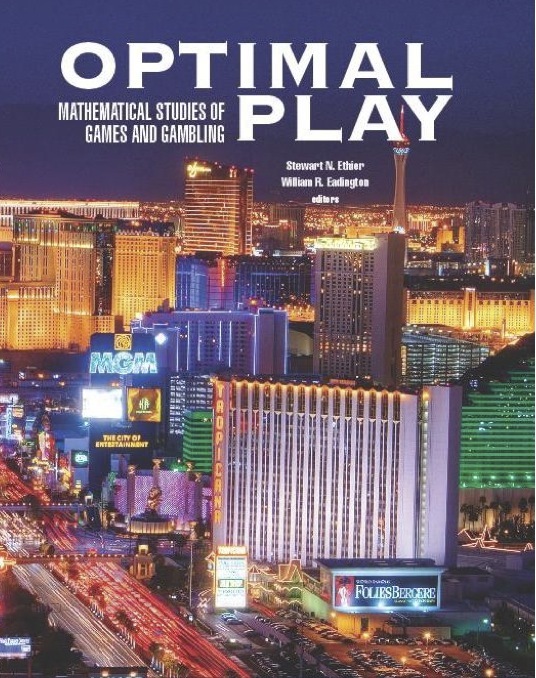 Optimal Play: Mathematical Studies of Games and Gambling, edited by Stewart N. Ethier and William R. Eadington. Published by Institute for the Study of Gambling and Commercial Gaming, December 2007. "The Endgame in Poker" by 2000 World Series of Poker champion Chris Ferguson and UCLA mathematician Tom Ferguson. "Backgammon: The Optimal Strategy for the Pure Running Game" by Edward O. Thorp, author of Beat the Dealer: A Winning Strategy for the Game of Twenty One. "Parrondo's Principle: An Overview" by Richard A. Epstein, author of The Theory of Gambling and Statistical Logic. "Much Ado about Baccara" by James Grosjean, author of Beyond Counting: Exploiting Casino Games from Blackjack to Video Poker. "Kalman-Filtered Radial Basis Function Networks for Horserace Odds Estimation" by David Edelman, author of The Compleat Horseplayer. Other games analyzed herein include blackjack, craps, video poker, slots, lotteries, backgammon, sports betting, le her, and faro. Theoretical issues addressed include gambler's ruin, loss rebates, house advantage, and proportional betting. Mathematical tools include game theory, group theory, stochastic analysis, Markov chains, branching processes, renewal theory, control theory, Kalman filtering, and multivariate statistics. In short, for those mathematically inclined readers fascinated by how games should be conceptually viewed and how strategies are developed, or just by how to find the edge, this volume is a treasure chest filled with intellectual nuggets. Serious mathematical analysis of gambling games can trace its origins to correspondence between the acknowledged founders of modern probability, Pascal and Fermat. They were asked to explain why a dice wager from the Chevalier de Méré had gone awry. From that beginning, interest in the probability of gambling games and opportunities has been of two distinct types. First, mathematicians have wanted to better understand, model, and analyze underlying probability structures of gambling games and playing strategies. Second, players have wanted to use these results to find ways that would allow them to consistently make winning wagers and fulfill the gambler's fantasy of finding an edge. This volume continues that tradition, with mathematically rich and pragmatically enlightening discussions on blackjack, poker, baccarat, video poker, backgammon, racing, and sports betting. Other discussions touch upon the Kelly criterion, proportional betting, Parrondo's principle, poker bots, and rebates on losses. The analyses presented herein often use mathematical tools and computational strategies that have evolved only in recent years. Contributors to this collection include individuals who have been among the top theoreticians in the analysis of gambling games, and include a few who have become well-known as practitioners of the gambling arts. Order at Institute for the Study of Gambling and Commercial Gaming for $59.95. View this page in Slovakian, courtesy of Blahoslav Konopka. View this page in Polish, courtesy of Valeria Aleksandrova. View this page in Spanish, courtesy of EngineArena.com. View this page in Romanian, courtesy of DontPayFull.com. View this page in Russian, courtesy of OpenSourceInitiative.net. View this page in French, courtesy of RouterInstructions.com. View this page in Danish, courtesy of Sandra Knudsen. View this page in Turkish, courtesy of Patrick Kaufmann. View this page in German, courtesy of Sarah Richards. Mark Bollman, MAA Online: "[T]his collection lives up to its claim to reflect 'the best problem solving and analysis' of mathematicians looking at gambling. [...] If you have a favorite casino game -- either as an actual pastime or a conceptual construct -- someone has done considerable mathematical legwork to break it down and analyze it, and you'll find some enlightenment in Optimal Play. If your game is backgammon, or if you prefer purely theoretical gambling, there's also some fine mathematics on those subjects included here. If not, what you'll find is a collection of fascinating excursions into applied mathematics, which is not in any sense a bad thing." Michael Shackleford, Wizard of Odds: "This 550-page book is comprised of academic-level articles on a host of gambling topics. My favorite was 'Are Casinos Paranoid? Can Players Get an Edge by Sharing Information' by James Grosjean. [...] It will be a good resource to have on my bookshelf." Nick Christensen, LV Revealed: "Optimal Play is a collection of research papers applying advanced mathematical techniques to some esoteric questions about gambling methods. A college-level background in mathematics is required to understand the vast majority of the topics discussed, and the number of distinct and useful ideas that can be directly applied to advantage gambling is quite small. [...] However, those who are not daunted by these reservations, are likely to find the research fascinating and the methodologies compelling. This is a very high-quality collection of papers [...]." David G. Schwartz, The Die Is Cast: "Saying that Optimal Play is a tough read for non-mathematicians is like saying that the Mona Lisa's a well-known painting. Understatement doesn't even begin to describe it. So this book is clearly not geared towards your average player, unless the average casino visitor is now someone with a Ph.D. in math. If you're not familiar with minimax, Bayesian analyses, and Markov chains, this is going to be a very frustrating read. "That said, this is a valuable book. Without these "esoteric" looks into the mathematics of gambling, there wouldn't be card counting or many other "advantage" strategies. So while you personally might not be able to appreciate the significance of some of the equations in here, there's a chance that, as these ideas are pursued, they will filter down to the casino floor. [...] If you're conversant in the language of math and interested in gambling, this book will be a rare treasure."